Fedua Dandelion Yellow | Light Your Nails! I am back with a colour that is not loved enough, yellow. Yellow means sun and life for me, thus I find it perfect for Spring-Summer. 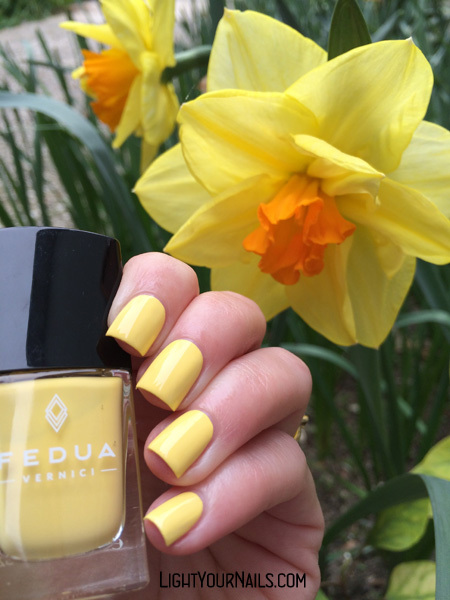 It’s indeed for the warmer season that Fedua released Dandelion Yellow. From the bottle though it’s a much lighter yellow than a dandelion, it’s more of a pastel yellow. On my nails it gets a little darker, but sure not that bright. Formula-wise it’s quite weird. Same as Fedua Warm Red the polish is quite thick, similar to wall paint rather than nail polish. But then again Fedua nail polish collection is called Vernici, that means varnish/paint. I need to add that weird is not negative this time, it’s just like no other polish I’ve used so far. Application is not that easy, but you can’t expect anything different from a pastel colour. However I had no big issues, you just need the first coat to be fully dry before going over it with a second coat. Otherwise the colour underneath will drag a little. Oggi sono di ritorno con un colore che non tutti amano, il giallo, che per me rappresenta il sole e la vita. Per questo motivo lo trovo perfetto per la Primavera-Estate. E’ proprio per la stagione calda che Fedua ce lo propone. Fedua Dandelion Yellow è un colore pensato “per chi ama osare, un giallo intenso come i petali della Bocca di Leone”. In realtà in boccetta non è affatto un giallo intenso, anzi è una tonalità chiara pastello, una volta steso sulle unghie in effetti si scurisce, ma certo non al punto da diventare un giallo vivo. Per quanto riguarda la formulazione è stranamente denso, come del resto Fedua Warm Red. Ha una consistenza che ricorda la vernice invece dello smalto per unghie. La linea di smalti Fedua si chiama proprio Vernici però, quindi direi che è perfetto! Sia chiaro che “strano” non è un aggettivo negativo in questo caso! E’ solo diverso da tutti gli altri smalti che ho mai provato. Stesura: si sa che i colori pastello non sono proprio semplici da lavorare, ma devo dire che non ho avuto particolari problemi. L’unica accortezza è lasciar asciugare bene la prima passata prima di farne una seconda, altrimenti si rischia di portare via un po’ del colore sottostante. Due passate con top coat. As you can see the colour is way more delicate than a dandelion! It fits quite perfectly my mother’s daffodils actually. Fedua Cosmetics was born last year and launched a high end nail polish collection, which is also B5F (i.e. does not contain Formaldehyde, Formaldehyde resin, Camphor, Toluene and Dibutyl phthalate). Fedua nail polishes are sold in a unique packaging that mimics a varnish jar. For more info about Fedua brand you can red my previous post >Fedua Warm Red<, or check >Fedua’s website<. What are your feelings for yellow nails? Like it or not? Come potete vedere il colore si abbina bene a quello più delicato dei narcisi, non proprio alle bocche di leone! Fedua Cosmetics nasce nel 2015 e lancia sul mercato nazionale ed estero una linea professionale di smalti esenti da sostanze nocive derivanti da petrolio, piombo e formaldeide, ovvero 5-free (Formaldehyde, Formaldehyde resin, Camphor, Toluene, Dibutyl phthalate). Tutti gli smalti FEDUA Cosmetics sono racchiusi in un innovativo packaging ispirato ad un barattolo di vernice. Per maggiori informazioni vi rimando al mio post precedente >Fedua Warm Red<, e al >sito web Fedua<. Cosa ne pensate del giallo sulle unghie? Vi piace o no? My favorite color is yellow. I don't really use it too much on my nails but I so have some. This color is gorgeous and it is beautiful on your nails. Your manicure is perfection! Thank you Lara! I really like yellow but it looks so bad on my skintone (I mean for clothes and makeup). I'll have to stick using it on my nails only. I like yellow nails! I like the shade as well. I agree with you that yellow isn't loved enough when it comes to polishes! This is a very beautiful color. Too bad the formula wasn't that fun. I didn't expect anything different from a pastel yellow though, so I guess it was no surprise! I love yellows and this is a gorgeous one. What a wonderful yellow!! This looks great on you! It's such a hard color to wear. I must say brighter yellows look better on me though! that is the perfect daffodil yellow. Sadly, it is one of those colors I just cant wear. That is a really beautiful color! It looks awesome on you! I love that it is bright but delicate at the same time. A beautiful shade of yellow!